What a wonderful event started by Radhika! !Am really happy to be a part in this event...This time i Paired with "Schmetterling words",she's having a nice blog with many baking recipes.I was suppose to try some from that, finally some ingredients was missing in my kitchen,So,i switched on to,"Poondu Kuzhambu".My way of "Poondu Kuzhambu" is little diff from this.Taste was really really tangy and spicy ,we liked it..Ok let's move on to the recipe!! Heat 2 tablespoon of oil in the pan. Temper everything under tempering ingredients list,one -by-one. Add onions,fry for a while. Then add Peeled Garlic,fry in a medium heat. 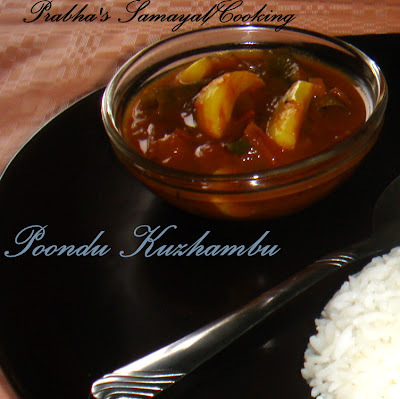 Add tomato and fry for 2 mins ,till get a little mushy.Can add little water to get a mushy. Now add the dry masala, add chilly powder,coriander powder and turmeric powder.mix well. Cook everything in a medium flame. Once the raw smell goes,add the tamarind juice in to it. Add 1/4 cup to 1/2 cup of water,while cooking. Close the lid,let it be simmer.Cook this for 5-8 mins,cooked garlic should have to be in firm not a mushy one.So do a check in between. 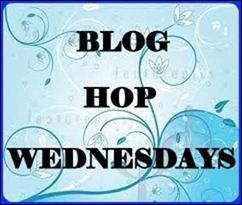 Look over "HERE" ,to see what we all doing in Blog Hop. A lovely tangy recipe...yumm with rice..
Yummy and tangy kulambhu,like to have it with piping hot rice. Sure we'll meet some time and share our thoughts. HI Prabha,mouthwatering poondu kuzhambu,lovely clicks.First time here,glad to follow ur tasty yummy blog.Hav some time in my space too n join ur hands with me. 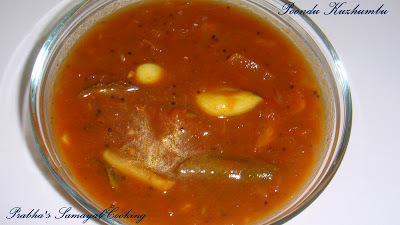 I love this flavorful gravy very much Prabha. 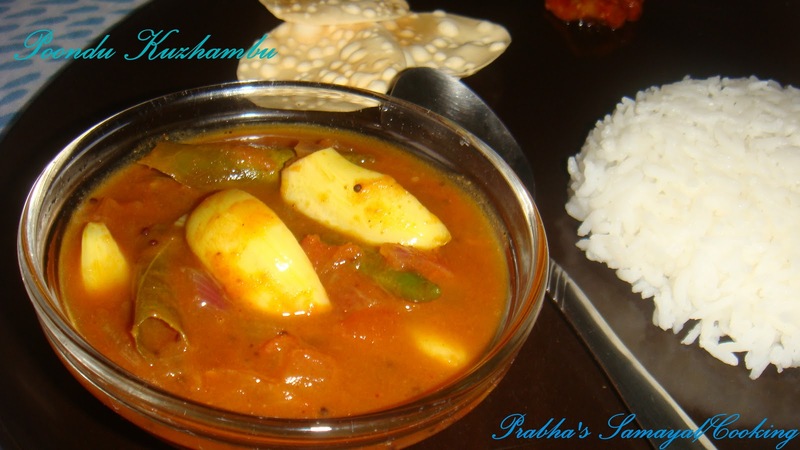 Excellent preparation..would really love this with steamed white rice. Hey guys,Thanks a lot for sharing ur comments here!! yummy preparation ! 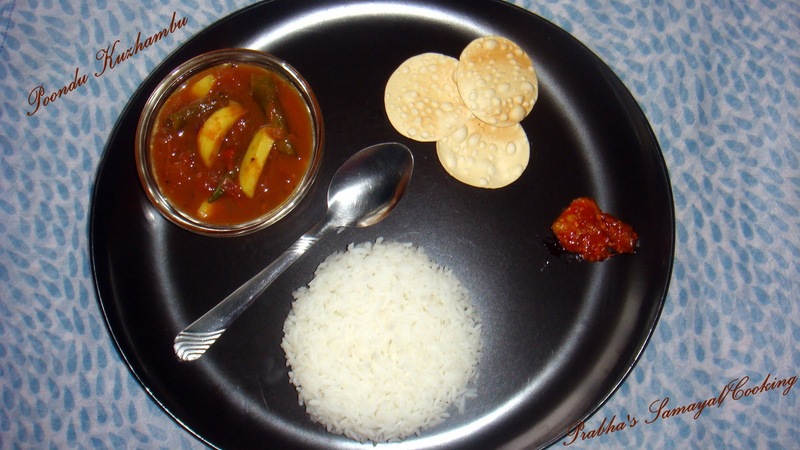 hubby loves this version without coconut - will soon try ! I am totally drooling.Lovely tangy side dish dear.